Free parking in down town area of Chora, exclusive for our clients Don't worry anymore about parking. Trohokinisi is the only car rental in Ios that offers parking space in the heart of Chora for all its clients, free of charge. Professional customer care & after sales support We provide professional support, low prices, bookings without the use of a credit card and well maintained vehicles! 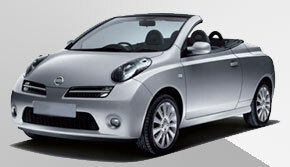 SPECIAL OFFERS We provide special offers for early car rental bookings and bulk bookings. Our Nissan micra cars are one of the best seller rentals every year and is preffered amongst young people that want to enjoy a flexible drive around Ios. 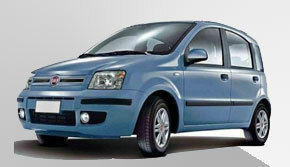 The Fiat Panda cars are offered in 1100cc, 1200cc, 1300cc 4X4. 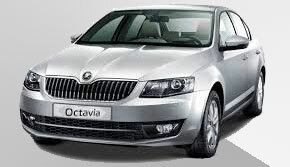 These cars are a common choice if you need affordable car rental in Ios Greece. 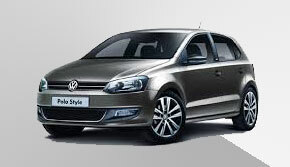 This VW POLO is automatic and usually prefered by people that don't want to use a stick. It is a smart choice as it does not consume a lot of fuel. This car is the biggest one we 've got. It is perfect if you want to cruise in a stylish way around the famous Ios beaches. Trohokini car rental in Ios Greece, is a family business that was founded in 1989 by Mr. John Gkikas and it was THE FIRST car rental agency in IOS. Furthermore it is the ONLY car rental agency that is located in the center of Chora village just next to the bars and clubs and offers PRIVATE PARKING AREA free of charge for all its clients. Trohokinisi has a fleet of 25 cars in total and offers a variety of solutions for every type of visitor. One of the most important advantages that trohokinisi car rental agency has, is its location and the parking area that is offered to all its clients free of charge! you will not have to worry about parking when going out to the clubs of the island. depending on the period of your visit, trohokinisi offers different solutions and packages following a fair price policy in order to provide affordable car rentals in ios. TROHOKINISI OFFERS AMAZING AFTER SALES SUPPORT. LIFE IS FULL OF SURPRISES SO YOU MIGHT RUN OUT OF GAS, OR HAVE A FLAT TIRE OR EVEN A MINOR ACCIDENT. IN ANY CASE OUR PROFESSIONAL SUPPORT WILL HELP YOU GET BACK ON your VACATION BY PROVIDING THE NECESSARY SOLUTION OR GIVING YOU ANOTHER VEHICLE (IF THERE IS ONE AVAILABLE).